Can a Donut be Healthy & Decadent? Yes! When Fall comes a calling, and the leaves begin to change color, the sweet smell of baked dog treats should fill the air. 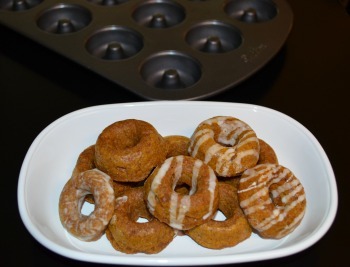 Making this Pumpkin Donut Dog Treat Recipe will fill your house, and your dogs belly, with the sweet smell of cinnamon and pumpkin. But can a doughnut really be healthy? You bet! We've packed ground flax seed into this little donut. Plus, pumpkin is naturally rich in Vitamin A, full of healthy fiber and very low in calories. These doggy doughnuts are also baked, not fried like a typically human treat. But, we added a little indulgence with the glaze. A little almond milk, sweetened with honey and thickened with tapioca flour makes a hard glaze that is a perfect compliment to the pumpkin donut. 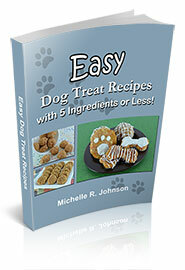 We are now able to offer our well received, Easy Dog Treat Recipes with 5 Ingredients or Less eBook on KINDLE! Of course, it's still available as a download that you can print out and make quick and easy dog treats for your precious pup. Frozen Pumpkin Pops - After all, it's not Fall everywhere! No time to bake? That's OK, but don't deny your dog all of the health benefits of pumpkin. Choose from the many Premade Pumpkin Dog Treats available online. Sharing your life with a dog means you are learning something new almost every day. Sometimes our sweet companions teach us compassion, patience, or to simply relax and enjoy a good nap. You want the very best for your dog, so learning about what we feed them is a big part of keeping them healthy and happy. "On the peanut butter topic, I use powdered peanut butter in the dog treats I make. I originally bought the powdered stuff for myself, but now I'm using it when I make doggie treats. Reconstituted with water, I like the way it tastes. I moved to natural peanut butter long ago, discarding the oil instead of incorporating it. So reconstituted powdered peanut butter is, in my opinion, much healthier."